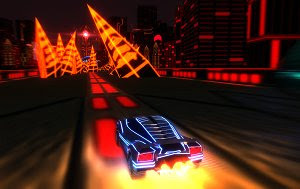 The prolific students from the DigiPen Institute of Technology released another game, this time a futuristic racing game with some amazing neon visuals similar to classic movies such as the original Tron or the lastest Tron: Legacy. Nitronic Rush is described by the authors as an experimental survival driving game with a fast-paced gameplay that may be compared to the successful TrackMania series, with impressive jumps, boosts and stunts. There’s also a story mode to go along with the stunt mode and other options. The online leaderboard is where your records will be displayed.